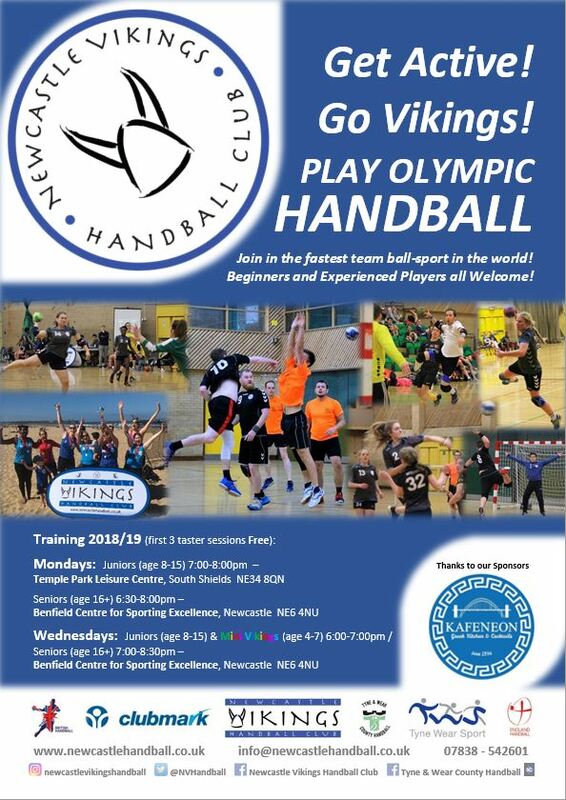 Newcastle Vikings Handball Club’s indoor training for the new season begins next month from Monday 3 September, as both our men’s and title-winning women’s teams prepare to begin their 2018/19 campaigns in their respective England Handball Regional League North divisions. Training sessions take place every Monday and Wednesday evenings, with new fun Mini Vikings sessions for 4-7 year olds now also taking place on Wednesdays in addition to our usual senior and junior sessions. Please note the changes in training times and venues for some sessions. Full details including location maps for the venues can be found on our Training page www.newcastlehandball.co.uk/training. For newcomers wishing to try handball for the first time, or more experienced handballers wishing to join the club, the first three training sessions are FREE! We’re also running free family handball sessions every Wednesday evening during September (5th, 12th, 19th and 26th} where parents can come along to the junior and Mini Vikings sessions (6-7pm at Benfield) and also have a go at playing handball too. Next Post:Vikings Ladies Lift EK Craig Walter Cup!